I recently wrote about my experience with Compassion Fatigue (CF) and burnout while working at an animal shelter. To learn more about CF, I reached out to Patricia Smith, founder of the Compassion Fatigue Awareness Project. The mission of the Compassion Fatigue Awareness Project is, “To promote an awareness and understanding of Compassion Fatigue and its effect on caregivers.” Patricia is a certified Compassion Fatigue Specialist with more than 20 years of training experience. She writes, speaks and facilitates workshops for all caregiving professions. The interview focuses mainly on CF in the animal sheltering world, but Patricia’s thoughtful answers are relevant to many of you. Compassion Fatigue is a secondary traumatic stress disorder resulting from caring for and helping traumatized or suffering people or animals. It is a reaction to the ongoing demands of being compassionate and effective in helping those that are suffering. Compassion Fatigue is not the same as burnout, though they can co-exist. Burnout can happen to anyone, in any profession. It’s a cumulative process marked by emotional exhaustion and withdrawal associated with increased workload and institutional stress. It is not trauma-related. CF is specific to those who are working with a traumatized or suffering population. If you work as a caregiver you may experience either CF and/or burnout. Compassion Fatigue has a more rapid onset while burnout emerges over time. The good news is that we can rebound from CF if we address and manage the symptoms (it’s more of a challenge to make a comeback from burnout). Jessica: Are the professional challenges that animal welfare workers face different than those in other helping professions (nurses, social workers, EMTs, etc)? Patricia: While many people wouldn’t agree, I definitely believe animal welfare workers have more difficult challenges. This is due to the fact that most animal caregivers go into the work carrying a true love for animals in their hearts. They certainly don’t choose the work because of the extraordinary benefits or high salaries. I found in my work as training and development manager at a shelter that people enter this field very idealistic, really hoping to make a difference in the way animals are cared for and treated. Unfortunately, it doesn’t take long for that bubble to burst. Working with an uninformed public only magnifies how little most people know about the human/animal bond. In the shelter where I worked, the turnover rate was extremely high. It didn’t take long before new employees figured out how disrespectful society is toward not only the animals, but shelter workers as well. In other helping professions such as health care, social services, law enforcement, teaching or firefighting, the workers are respected and even idealized. This is not the case with shelter workers. Most people believe they are part of the problem since they euthanize animals. Most often, animal caregivers leave shelter work beaten down and disillusioned. The ones who stay grow the proverbial “thick skin” in order to deal with the negativity they face, day in and day out. J: I can’t help but think that if compassion fatigue and self-care were taken more seriously in animal sheltering, employee retention rates might be higher, which would allow for staff to stay in the field longer, gaining additional skills, and contributing at a higher level. Any thoughts on employee turnover in relation to compassion fatigue? P: You have hit the nail on its head! As I mentioned in the first answer, yes, turnover rates are extremely high most likely due to compassion fatigue, so are Worker’s Comp claims and high absenteeism among staff. I firmly believe when the majority of workers in an organization suffer the symptoms of compassion fatigue, the organization itself takes on the symptoms of organizational compassion fatigue. This includes high Worker’s Comp claims, absenteeism, inability of staff and management to collaborate, inability of staff to follow rules and regulations, and lack of flexibility and adaptability among workers. Eventually this all affects the bottom line and lack of funds creates another layer of challenges: paying decent wages and benefits, lack of quality in the care the animals receive, inability to retain talented workers – the list is endless. J: Does management need to make self-care a priority in order for it to be taken seriously? P: Yes! Turning around a shelter environment that is plagued with compassion fatigued workers is the job of management. Those in leadership positions need to understand and recognize the symptoms of compassion fatigue in themselves and their staff. They must educate themselves and others – that is the first step. I have been working on creating a new hire guide to compassion fatigue that would be included in every single new hire’s orientation. That is where we need to start – in the schools and in the orientation. If that could happen, animal welfare workers could go into their new positions with eyes wide open. I believe that would make a huge difference in retaining people who care and want to make a difference in the lives of animals. J: Neglecting self-care care can have negative consequences for the people and animals we care for. For example, compassion fatigue has been linked with ethical violations and impaired functioning. Have you found that compassion fatigue impairs our ability to do good work? If so, are we obligated to take better care of ourselves? P: Authentic, sustainable self-care is the ONLY answer to healthy caregiving in the helping professions – but mostly in animal welfare. If we are “other-directed,” which means we care for others before caring for ourselves, it takes hard work to learn to become “self-directed” so we can be healthy caregivers. Self direction means that we have personal boundaries, we are able to say “no” without feeling guilty, we know our limitations and we honor them, and we practice self care daily. We need to heal our deep hurts and not allow ourselves to be re-traumatized by the work we choose to do. We learn to focus only on the mission of the organization – which in animal welfare is to rehabilitate each and every animal to the best of our ability to prepare them for a successful adoption – without drama, without the symptoms of compassion fatigue directing our actions and behaviors. This takes work!! I think the reason this is all so important in animal welfare work in particular is because the animals pick up on our feelings, emotions and actions. They are super-sensitive to us and how we react to our environment, to each other, and to them. A calm, peaceful environment when they enter the shelter, veterinary office, or animal hospital sets the tone. Nervous, unhappy, frazzled animal workers = nervous, unhappy, frazzled animals. And they deserve so much more! J: Is there anything we can learn from other helping professions about support and self-care? For example, social workers often participate in clinical supervision or peer group supervision where they can have a safe place to talk about their challenges and learn from one another. P: While there is much to be learned within all areas of the helping professions, I don’t believe the necessary sharing is actually happening. And that could be that each profession has its own challenges, difficulties and unique environments. 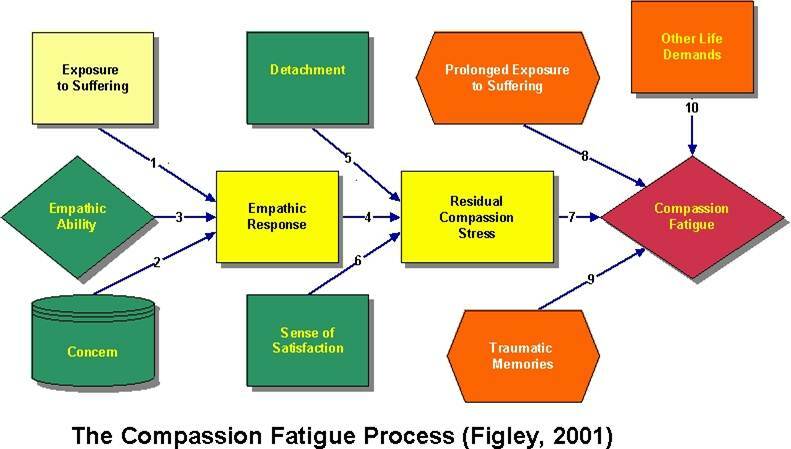 The one thing I have seen in my 14 years of doing this work is the increased interest in compassion fatigue, its definition, symptoms and causes. I am asked to present workshops often and mostly from animal welfare organizations. I think this is due to necessity. Many shelters are suffering from decline in staff, decline in funding, and increased numbers of animals in their care – I think maybe we are hitting the tipping point. It is painfully obvious that something needs to be done. My job as founder of the Compassion Fatigue Awareness Project is “to get the word out.” Since my background is in journalism, I write on the subject as often as possible to reach as many people as possible. Others are now doing the same. I helped edit a wonderful new book entitled When Helping Hurts: Compassion Fatigue in the Veterinary Profession by Kathleen Ayl, PsyD. She did an excellent job of explaining compassion fatigue and how it affects animal welfare workers. While it is aimed at the veterinary profession, every animal caregiver will benefit reading this book. You, too, are doing an excellent job with this blog to get the word out. We’ll get there – I know we will. I urge anyone reading this blog to organize a group and begin the much-needed dialogue about compassion fatigue and how your organization can support self-care for staff and management. Engaging in regular self-care builds resiliency, which can help us bounce back from the stress of our jobs. 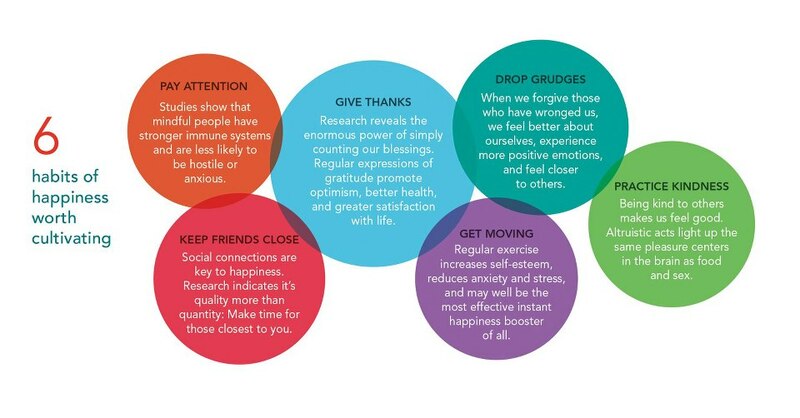 The self-care tips above also cultivate happiness. Yay! Graphic from The Greater Good. J: Some of my readers have started support groups for shelter workers or for families who are caregivers for dogs with behavior or medical issues. Do you have any tips for creating a successful support group? a) If you hold de–briefing sessions following traumatic incidents at your organization, ask participants to share feelings and not details. Often when we are traumatized by situations such as animal abuse or animal hoarding, we want to give a voice to our pain and suffering. Unfortunately by doing that, we run the risk of re-traumatizing our fellow workers. Talk about how the incident made you feel – sad, frightened, alone, maybe even sick to your stomach. By sidetracking the gory details we are able to identify our feelings and, hopefully, apply our healthy coping skills to alleviate the pain and suffering we are feeling. Healthy coping skills include yoga, walking, massage, meditation, restful sleep, or seeking professional help if necessary. We can also turn to our animal companions for love, understanding and relief. Unhealthy coping skills include alcohol consumption, drug use, smoking, eating fast food, or isolating ourselves from others. b) Select a facilitator who has both education and experience in managing a group. Managing traumatized/compassion fatigued people can be a challenge of the highest order. A good facilitator will be sure everyone knows the rules, everyone has a voice, and everyone is heard. Time management is also of the utmost importance. c) Limit the number of participants. A group of 6-10 is ideal. Everyone deserves a chance to speak. d) Never force a participant to take an active role if he/she declines. Some participants will be able to speak the first time, others will take longer. Be respectful of each person as an individual with specific needs and abilities. e) Lay down the groundwork for success in the beginning by explaining the rules. If a participant shows an aggressive side or is disrespectful to others, the facilitator has the right to dismiss that person from the group. J: Vet techs, rescue and shelter workers, animal control officers, individuals with pets who are suffering – compassion fatigue seems to touch so many of us. What can we do as individuals to reduce stress and avoid burnout? P: You are exactly right. Compassion fatigue doesn’t play favorites. First, are you at risk for compassion fatigue? One way to find out is to take Dr. Beth Hudnall Stamm’sProfessional Quality of Life Self-Test (you can take the self-scoring test here). More than fifteen years ago, it was this test that revealed my own high levels of compassion fatigue. This knowledge led me on a path to healing, but it took quite awhile and a lot of education on my part. I truly believe the number one thing we can do to reduce stress and avoid burnout is to be self aware. What causes our stress? What are the triggers? How do we manage our stress? Or do we? Stress is too much – too much work, too much pressure, too many deadlines. Burnout is not enough – not enough time, not enough resources, not enough energy. When you add compassion fatigue to that mixture, you have a crippled individual – body, mind and spirit. Self awareness begins with education. Not only learning about stress, burnout and compassion fatigue, but learning about ourselves. By creating a Personal Mission statement (what is my promise to myself? ), and following up with a Self-Care plan (start with one goal and make yourself accountable), we can begin the path to healing that will make it possible to continue to make a difference in the lives of our wonderful furry little friends. J: Beyond increasing awareness and education about Compassion Fatigue, what are a few concrete, everyday ways for shelter staff and management to incorporate and support self-care in their work place? Take the CF self-tests regularly. CF is never healed and it can creep back into our lives. Raise your Compassion Satisfaction levels. Management must take part and have buy in. Staff learns by example; leadership leads by example. Offer corporate/organization Wellness programs: yoga, exercise, Weight Watchers, smoking cessation programs, time management classes. Provide adequate pay, PTO, vacation time, and benefits. Make vacation mandatory. Many thanks to Patricia for this interview and her invaluable work through the Compassion Fatigue Awareness Project! Please visit her Facebook page and website for more resources, including self-assessment tests. Her book To Weep For a Stranger is available on Amazon. If you’re exploring CF, this is a great place to start! The Notes from a Dog Walker Amazon store has a collection of books on CF and self-care. Vets and Vet techs: Continuing education in CF available here. The American Veterinary Medical Association’s thoughts on CF in the workplace.